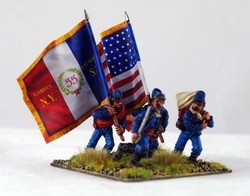 A 40mm wargame flag from Battle Flag's "After the Battle" range is used to maximum effect in this stunning vignette of Gringo 40's miniatures by the incredible Angel Aparicio. 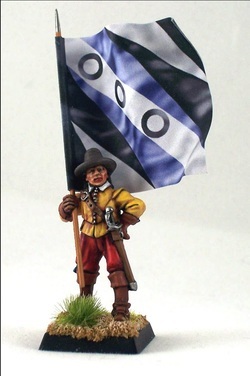 This 28mm Royalist standard bearer, painted by yours truly, carries a wargame flag from Battle Flag's English Civil War range; and infact was the very first flag I designed. The wife had bought me a huge Renegade Miniatures ECW army as a Christmas present and finding the market somewhat limited in choice and quality I decided to design my own flags. The most difficult part of the design process was creating the "living silk effect". It had to be scale in appearance; I tried printing on fabric but the weave of even silk is far to course for any thing like a scale effect. So having been involved in the Fine Art industry for nigh on 25 years I decided to use products that are normally only used in the creation of fine art; archival quality inks and acid free papers would ensure lasting brilliance, quality and of course value for the wargamer. 1st Corps contacted me shortly after I launched Battle Flag and asked if I would be intrested in producing the official range of flags for their company. The rest is history, as they say, and 1st Corps now carry our full range of wargame flags to all major UK wargaimng shows. These command groups have been painted by Michael of 1st Corps , as you can see an expert paint flicker, and come from his own personal collection.